Call today for a free quote on termite control in Spring Hill, Homosassa, Weeki Wachee & the surrounding areas in Hernando, Citrus, and Pasco Counties in FL. Is Your Home safe from termites? Are you sure? $4.5 Billion dollars will be spent on termite treatments and termite damage repairs on over 2,000,000 homes that have termite infestations this year. And the losses that result from termite damage are not covered by homeowners’ insurance. Settlement cracks that begin to develop after your home is built provide easy access for Subterranean Termites to enter into wall voids, door casings, and many other areas of your home. Conventional subterranean termite treatments are performed using chemicals applied to the soil under the foundation of Florida homes during their construction. They rely on the integrity of the concrete slab to act as a barrier against termites. When this integrity is lost, so is the integrity of your termite barrier. Having the peace of mind of knowing your home is safe from subterranean termites is easy. Pick up the phone and call EcoFloridian® and ask for a FREE Subterranean Termite Inspection performed by one of our highly trained, Florida Department of Agriculture, Bureau of Entomology and Pest Control, Licensed Termite Inspectors. A termite resembles a flying ant in size and shape. It has four wings and a soft, light-colored, tubular body. Most termites lack eyes and find their way around via their sense of smell or by following paths of moisture. Thousands of termite species exist, but as a homeowner or a businessperson, you really only have to worry about two main groups of them. First, subterranean termites set up nests in soil, and they build tunnels that take them to sources of food. Second, Drywood termites will often enter a building and stay there. These insects like to dwell inside the walls and the furniture in a home or workplace. Whenever they're indoors, termites will devour just about any pieces of wood that they can reach. Worse yet, in many cases, people don't notice any signs of a termite infestation until significant harm has been done. Moreover, it's extremely difficult for a nonprofessional to eradicate these bugs. That's because their precise hiding spots can be nearly impossible to locate. Also, once these pests breach a building, it's likely that more of these creatures will soon be on their way. You might be surprised by how fast termites can cause destruction. A termite's mouth, like a rainbow or the Grand Canyon, is a wonder of nature. It's tiny but powerful, and it can easily tear apart a piece of wood or paper. Thus, termite swarms can rip books and documents to shreds. They can ruin beautiful furnishings. They can weaken shelves, causing expensive objects to crash to the floor. These insects can even compromise poles and support beams to such an extent that a building will no longer be structurally sound. Fortunately, EcoFloridian® Lawn and Pest Control can help you get rid of termites and keep them away for good. We are proud to offer free termite inspections in your area. If we find insects living in your residence or workplace, we will remove them in a safe and nontoxic manner. Just as important, EcoFloridian® Lawn and Pest Control can prevent future termite invasions. 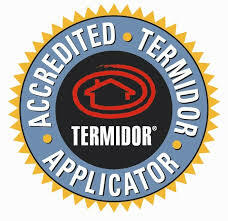 In fact, we are an Accredited Termidor Applicator. As such, we have an array of specialized tools and techniques to keep those wood-loving bugs away for good. For instance, we could treat your soil with non-harmful, odor-free, organic materials that will repel termites ― substances that won't seep into your groundwater. Alternatively, we could place termite traps around your property. we could also set up barriers that are made of rock or sand around the perimeter of your home or business, obstacles that termites can't pass through. In addition, EcoFloridian® Lawn and Pest Control can monitor your residence or workplace over time to make sure that its methods have been completely successful. Call Today for a Free Termite Control Quote! No matter what your pest control needs might be, you can always call EcoFloridian® Lawn and Pest Control for prompt and courteous service, and you can count on outstanding results.